Yahoo! 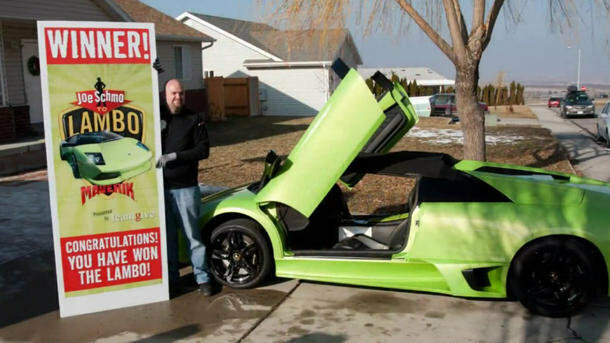 – Thanks to a Utah convenience store’s contest, Frito-Lay truck driver David Dopp won another set of wheels last Saturday: this lime-green, 631-hp Lamborghini Murcielago LP-640, worth at least $200,000. Such an awesome car that will…oops, he already wrecked it. Just a few hours after getting the keys to the V-12 powered Italian supercar named for a famed Spanish fighting bull, Dopp took to the roads around his home in Santaquin, Utah. According to In Santaquin News, police were called about dusk after a witness spotted the all-wheel-drive Lambo bass-ackwards in a field, with skidmarks from where it left the road. The Murcielago is now bound for Las Vegas, where mechanics will calculate a repair estimate on the busted oil pan and damaged bumper. Dopp, who has insurance, says the day was “an emotional roller coaster.” If you mess with a bull, don’t be surprised when you get the horns. A few things: First of all, this cat had a facebook update earlier in the day… prior to crashing his new whip: “Just had Santaquin Police called on me for driving too fast. SORRY !!!! .” Oh yeah? SORRY all caps, multiple exclamation points, and a smiley face? 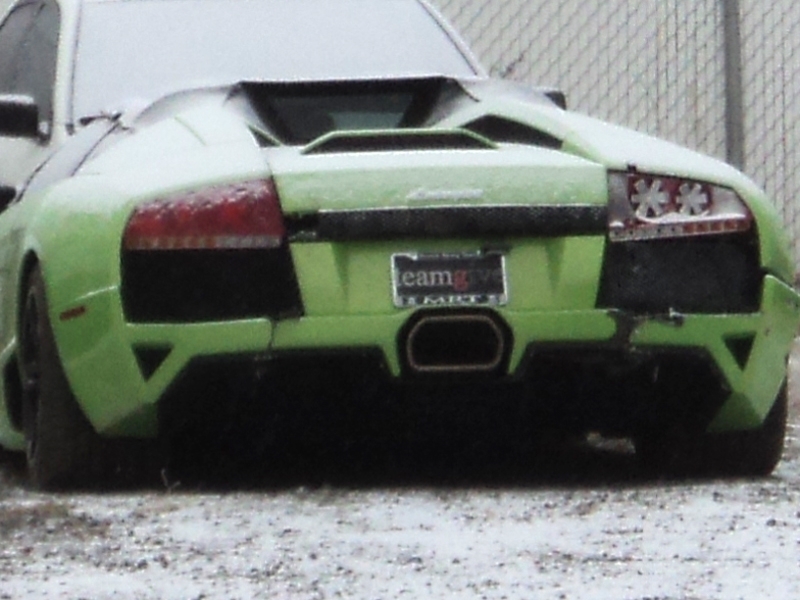 Bro, you’re asking to wreck your new lambo. Second…the hell kinda ‘convenience store’ gives away lambos? I get fired up when 7-Eleven has 3 for $2 coupons on Nutri-Grain bars….freaking Lamborghinis. Get the hell outta here. Last thing…lime green? Pass. 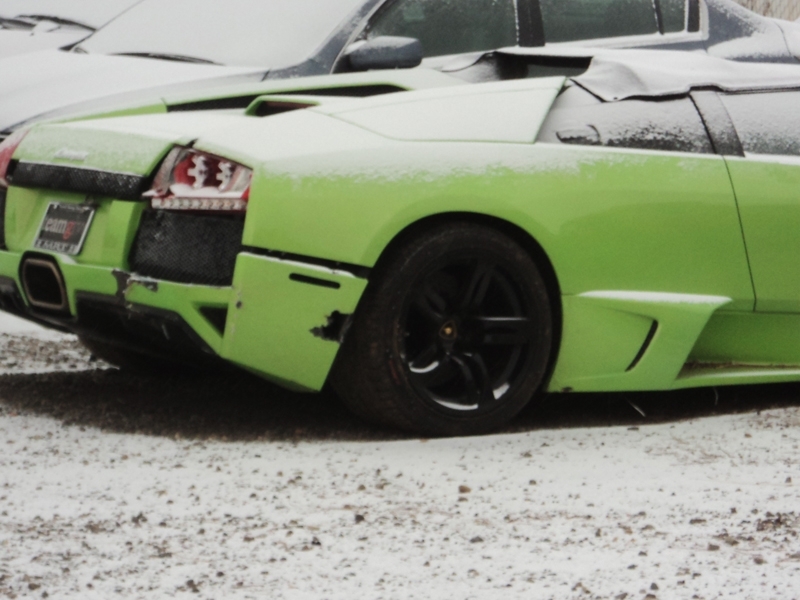 This entry was posted in Cars and tagged Lamborghini, Lamborghini crash, Lamborghini giveaway. Bookmark the permalink.